Damian McConville with his wife Martina and sons Eoghan, Ruairi and Aodhan. Local man Damian McConville is set to get his walking shoes on today (Friday), when he will join his colleagues from Lloyds Banking Group and take part in a 13 mile sponsored walk for a cause very close to their hearts, Defibs4kids. Damian, a manager of Lloyds, is a member of the Defibs4kids committee, a charity set up by his wife Martina and Art Kernan, a teacher at St Colman’s Primary School, Lambeg, which aims to encourage every school to have a defibrillator on site. Damian has more than one reason to support the Defibs4kids campaign. As well as having Cardiomyopathy himself, his young son Eoghan also has the condition. Eoghan, a pupil at St Colman’s, underwent open heart surgery at just four years old. The walk will begin at 9.30am in Lisburn, at the Professor Frank Pantridge statue at the Lisburn Civic Centre, as this year marks the 50th Anniversary of the invention of the portable defibrillator. Damian’s wife Martina commented: “In 1965 the first portable defibrillator invented by Professor Frank Pantridge, weighing 70kg, was installed in an ambulance in Belfast. “This year marks the 50th anniversary and we felt it very fitting to honour this by starting the walk at the memorial statue of Frank Pantridge at the Island Civic Centre in Lisburn.” The walkers will follow the scenic tow path route to their Gasworks facility in Belfast. 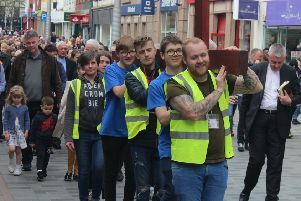 This year will mark the second anniversary of this 13 mile walk by Lloyds, which is hoped will become an annual event. Amongst those supporting the event will be Lisburn and Castlereagh City Councillor Margaret Tolerton and Community Sports Development Officer Kevin Madden. It is the aim of all the Lloyds employees that the money raised will be used to assist at least three schools in rural areas across Northern Ireland to purchase a defibrillator and acquire the necessary life saving and CPR training for their entire school community. Lloyd’s ultimate aim is to continue to raise awareness of this very worthwhile campaign by Defibs4kids and one that can only be described as a life saving initiative.